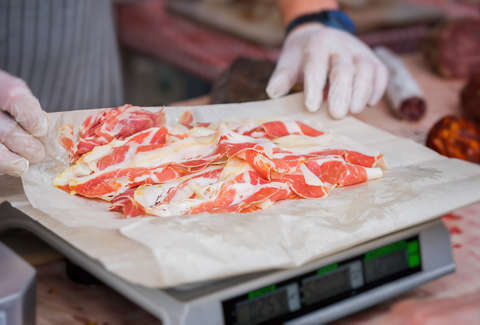 Cold cuts are meant to be snacked upon. This is their nature. And sliced ham might be the most satisfying of all snacks. You can only imagine, then, what temptation deli workers face every day, surrounded by meats upon meats, ripe for plucking from the vine of capitalism. A grocery store employee in Bolivar, Ohio was apparently so unable to resist this temptation that she's been charged with felony theft. According to a report by the Associated Press, she's alleged to have eaten three to five slices of ham during every one of her shifts at Giant Eagle over her eight years of employment, and the accumulated theft added up to $9,200. Someone tipped off the store's loss prevention manager, and the perfect crime was foiled. “She was very cooperative,” Tuscarawas County Sheriff’s Deputy Brian Hale told the Columbus Dispatch. It's also reported that at times she helped herself to salami. Let she who has never liberally helped herself to cold cuts cast the first stone.